Guardian fashion blog bitten by the stitching bug! You guys, this sewing shizzle just got real! One of my favourite ever bloggers - Karen of Did you make that? 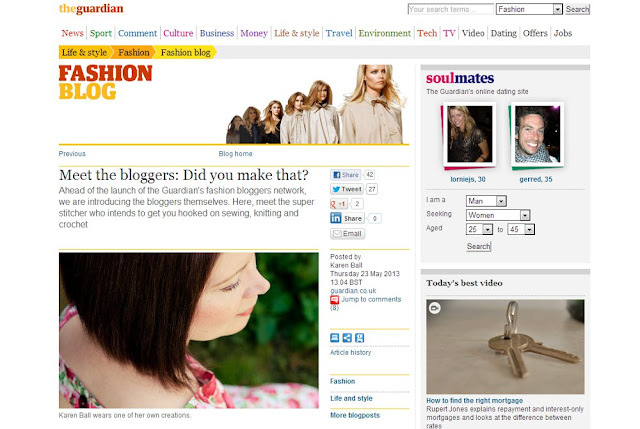 - has just had her first contribution published as part of the Guardian's fashion bloggers network! Even better, it's the first in a series of weekly blog posts from Karen, which I'm seriously excited about! I think you'll all agree that this is a huge deal for our little stitching community! This kind of opportunity to propel our passion into the 'mainstream' doesn't come often and we're lucky to have such an eloquent and engaging writer to represent us. And boy does Karen promise to deliver the goods. She says, "I'll give you everything you need to create a unique sense of style. Sewing in Sixty Seconds Tutorials. Knifty Knitting projects...There will be guides to the best independent pattern designers and a rundown of Britain's bargainacious fabric and haberdashery suppliers. I will give you top tips, insider information, spotlights and features from some of the most cutting-edge creators." Go on girl, sock it to them good! I'm off to bed now, feeling uplifted and very proud, not only of our Karen, but for being part of our wonderful stitching community. That is so cool! I'm looking forward to the weekly posts. Yeah it's really great. I'm especially looking forward to her knitting tips! Hi Marie, I can't find an email for you on your blog....so I'm wondering if you would like to participate in a series I am doing . I have a spot open on JUne 18. Please e mail me and I'll e mail you the details! I'm so happy for Karen! It's so exciting! Intresting clotehessss! Great blogg, keep posting. i love that sewing is getting some mainstream recognition!